My ancestors farmed the same blot of land in Switzerland for over 10 century and I spent my whole working life in factories with my fellow workers supplying society’s domestic needs, to assist primary producers, the extractive industries, and manufactures. So, I’m interested in the history of people who sustain societies rather than the ones that dominates us. Unfortunately my schooling was a tortures time for me in most of the eight schools I attendant 4 of them in France, in 3 very different parts, the first ones were in a village next to Dun-sur-Meuse, then one in a suburb of Paris and the last one in Martigna a mountain village near Switzerland, I left France at 10 years of age and arrived in Sydney just before the WWII, one of the reason to flee Europe. The first school in Sydney was La Perouse School, it was the most notable one for me, my sister and I attended it and I founded it to be a very enjoyable and an interesting time, it was basic as the state did not waste resources on such children. We played with aboriginal children and those of unemployed parents, they were destitute living in a place called happy valley. The children were all bare footed, I found it very cold in winter but had to be like the others so the shoes stayed home, I had never seen such poverty and homelessness surrounded by so many vacant houses that had a ‘’to let’’ sign, while many families were living under rusted leaking corrugated iron lean-tos. Also Aborigines in those times weren’t counted in the census, they were regarded by many people of the time as not on par with Europeans and of the lowest value, thus mum decided we were to go to a higher status school for the months before we could move to our new school and home we had put a deposit on in an upper middle class suburb. But I missed the friendliness of the teachers and kids as they were so accepting. The new school was a disaster for me it was the last primary class with an exam at the end of that year to see if I qualified to go to a high school as my brothers did before me, but it was hopeless due to my unrecognised dyslexia, I knew that but the expectation that I’d follow my brothers was assumed. It was a frightening times that only got worse especially as I had to repeat and have another year of despair and I was due to spend 3 years in the last class of primary school, but the school had no use of me as I was too heavy for the football team, which had been a lesson in the art of cheating. After the trauma at home had die down a little the family agreed to the new school that would coped with my disability and fostered my abilities this gave me hope and an enthusiasm to participate in the school’s activities. I was very happy to be in that school, which was for children with learning difficulties, I’m deeply appreciative of the staff, it might have save my life, they also gave me a deep appreciation of nature, as they took a few of us on bushwalks overnight explaining the geology, the fauna and vegetation of different areas. They also fostered my interest in acrobatics, and gave me a marvellous footing for my interest in engineering. It was a non-competitive education, I only realised that I was so much better than all the other boys when I left school, as there were two classes of the same grade and I had no notion until I was given my report to help me get work as an apprentice to a trade. But my literary standard was no better than in France I’ve always came last due to my dyslexia, my reading and writing abilities were dismal, it appalled and shamed my father. This is especially as later my two older brothers top their university science studies and got their PHDs soon after and one became a professor as soon as his age was acceptable, and then my younger sister practise as a specialist doctor. At that time dyslexia wasn’t known so my mother thought that I was clever put incredibly lazy, while my father’s evaluation of me fluctuate between stupidity and dishonesty, I was confused so I accepted my mother’s assessment and I always felt I could have done more. I left school at fifteen and I was able to be apprentice as a fitter and machinist and later worked as a toolmaker, and as such I managed to be involved in making or fixing things for practically every aspect of Australian society. I’ve receive some of the highest praise for some my work, which had been regarded as impossible to do with the equipment of the time, but that had little impact on my lack of self-esteem due to my very poor literary ability the shame most of us with that disability had was incredibly difficult to overcome no mater of the applause during my brief acrobatic career and the ability to solve complex geometric problems as a toolmaker. Fortunately the University of the Third Age gave me the opportunity to express myself an almost overwhelming task but soon came the PCs with a spellcheck looking up dictionary was tedious especially with my poor sequencing ability which gave me much trouble remembering the alphabet. Computers open up a new world for me and I was over the moon when CC used my item. 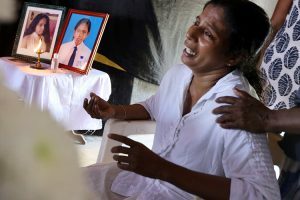 I’m deeply grateful to Binu Mathew for publishing my piece it encourage me to investigate social issues and even more important Binu has been an inspiration for me and stimulated me to further my interest in creating a peaceful world. The following is my take on what I consider to be the scrabbling in civilisation, which has produced today’s dilemmas and if continued tomorrow’s extinction. It’s my interpretation of the history and the origin of capitalism of today’s dilemma as experienced a long way from the top of society. Slaves powered all civilisations until the end of The Western Roman Empire they were own by the wealthy people while serfs were attached to the land they lived and worked on, which belonged to privileged individuals. Serfs and artisans produce all society’s needs, its food, built the shelters, churches and castle-fortress. Nevertheless, serfs and artisan had little to no power over their destiny. That was the time that gradually produced the dynamics of today’s world with its many contradictions in our knowledge and ignorance, our kindness and brutality, our honesty and deceptions, and our cooperativeness even within competitive economies. Christian ideology maintains that all humans are equal in the eyes of god; that was crucial as it help to set the stage, unintentionally, Feudalism applied it as narrowly as possible thus serfs and artisans where duty-bound to provide all societies needs the best way they could, with at best only marginal interference. That’s once their lord and clergy were satisfied, serfs could then feed themselves. That little freedom enabled those workers to live a better life at the same time as increasing societies’ powers to extract more from nature with the least stress on it and themselves. Intellectuals were involved in spiritualties, thus not part of the economy, while those competitive individuals striving for total civil power were fighting for it. This freed the serfs and artisan to reduce their load by innovating better ways to supplied all society’s needs with some protection and with little interference from their local church, but burden by their lords. This was the embryo of capitalism within a socialist commune, the task of maintaining the community was shared by serfs and skilled workers. It created the new era of labour saving methods and devices that seemingly has eternal needs. It was a slow beginning as the previous eras were human powered, more people more power equals greater control by a few over more people. On the other hand, those illiterate peasants and artisans were motivated to feed and house their community and themselves, they also constructed churches and castles for their nobles so they can protect themselves from other nobles when not attacking them in their castles. It was the start of our modern era of free enterprise within social obligations. Peasants and craft workers maintained societies’ functionality within their limited sphere while the true believers were fixated on the afterlife and the royals were busy expanding their domain, which resulted in little to no infrastructure and unsanitary situations, but serfs were better fed and in better mental condition resulting in a slightly longer lifespan than slaves. 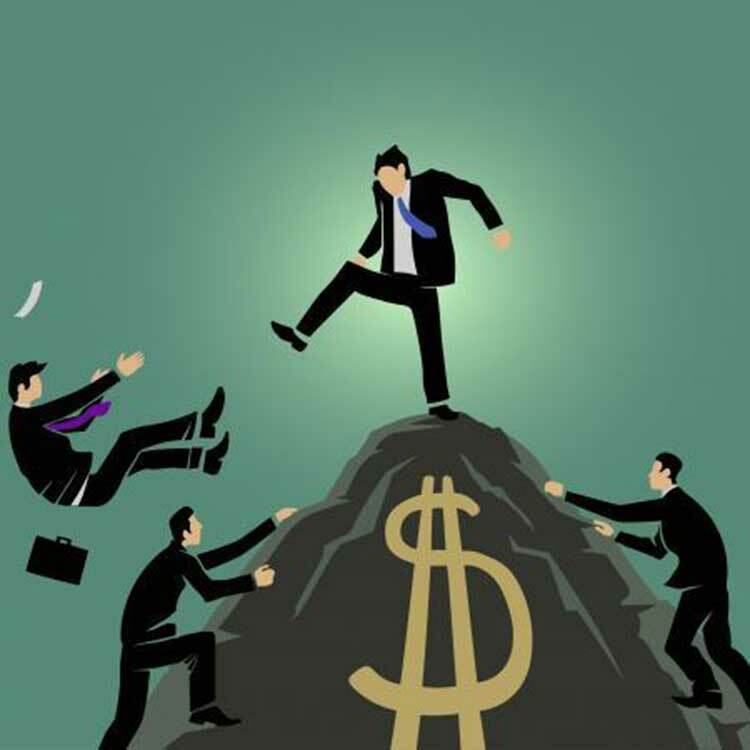 Both recipient parts of serfdom were competitive they had an incentive to increase their power and influence with more people, however, it was a great disadvantage for those in the workforce as they had the same fertile land to feed a larger number. The undernourishment with the unsanitary conditions exposed everyone to plagues, which reduced the population to less than two third of its pre-plague times. That reduction enabled much better living and work conditions for survivors, as a lack of labour raises its value and gave more power to those workers, but more significant, is a demand for innovations to produce more from fewer worker, many of them were home grown, or from anywhere of any time. Those innovations had increased society’s abilities in many fields, very slowly at first but as labour saving technologies increased; knowledge expanded, releasing more creativity in spite of considerable interference from their lords. Very little has change to this day, people who are dependent on their work for their living have very little to no power in their social set up, regardless of voting rights, as it is with the educated in sciences and engineering, have little influence in the direction society takes. An individual grape stomping as a form of wine pressing. Rib vault(12th century) An essential element for the rise of Gothic architecture, rib vaults allowed vaults to be built for the first time over rectangles of unequal lengths. It also greatly facilitated scaffolding and largely replaced the older groin vault. Chimney(12th century) The earliest true chimneys appeared in Northern Europe during the 12th century, and with them came the first true fireplaces. Segmental arch bridge(1345) The Ponte Vecchio in Florence is considered medieval Europe’s first stone segmental arch bridge. Vertical windmills(1180s) Invented in Europe as the pivotable post mill, the first surviving mention of one comes from Yorkshire in England in 1185. They were efficient at grinding grain or draining water. Stationary tower mills were also developed in the 13th century. Johannes Gutenberg‘s great innovation was not the printing itself, but instead of using carved plates as in woodblock printing, he used separate letters (types) from which the printing plates for pages were made up. This meant the types were recyclable and a page cast could be made up far faster. Military technologies (I’m not going to elaborate on any destructive devices. Those new innovations to reduce the workload or to enable to do what was impossible before, increased at an accelerating rate by the end of the Middle Ages, it also enable a few to look to other fields. Greed, the need to have more than others is the driving force of mercantilism that’s trade with known participants that can grow both economies. Imperialism on the other hand is slavery of whole communities that are conquered, controlled and exploited by innovative aggress civilised nations; also individual had more freedom to contribute to the wealth amassing ability of their kingdom. However the search for Gold, if successful, only increased a few individuals’ wealth at the expense of society as gold plays practically no part in the real economy. More gold only reduced its value, as it did in Spain. However it, with other rare things stimulates and controls much of civilised insane thinking. Therefore, in1492 to 1503 Christopher Columbus in search of gold encountered indigenous Cuban people, who he said were peaceful, friendly, and helpful, therefore easy to deceive as they never experienced the dishonesty of civilised people. That rediscovery of the new world inspires Europeans psychopaths to take those new territories and used its people, it was outlandishly cruel but it was an economic spur, “Christians” couldn’t resist the opportunity to have slave while still be against the idea. So, they invented a hierarchy based on the shade of one’s skin, the darker the less human. This is because they were already using African slaves and as they had a very dark skin due to higher solar radiation there, but more important they were slaves of other Africans and could survive such inhuman existence. Nevertheless, that slave trade on such a scale is unique, dark skin people became a commodity that could be traded as an object, and it created the most entrench violation of nature to satisfy the north western European greed for economic dominance. It wasn’t ignorance or stupidity; it was the clever psychopath oppressive ones in charge who could enslave and used people like we use robots. Despite the incredible dishonesty or because of it, Europeans saw themselves as superior, the noblest of all people, that lie is still believed, covertly, by many people. Although a few in the UK soon realised the inhumanity of slavery, even as some of them benefitted from its trade. British manufactured goods were sold in Africa to buy slaves to sell them in America to buy the cotton and other produce and ship it to England to process then and sell those products to Africans and so on. It enriched the few. The invasion by Western Europeans of the new world brought many riches and generated a need to take ever more by whatever means. Crucially, it produced a demand for wood in England to build ships to transport slaves, goods, and rob the treasures from whoever has them at the time. The British, like everyone used wood for all heating needs, but the navy needed that wood for their ships. So down the mines went the children to get the coal for the lower classes needs until they reached the water table and to keep going down, steam powered was used to pump that water out. It’s where coal fired steam power was first used, but it used so much coal it could only be of benefit at the mine sites. Nevertheless, it was the beginning of a new era increasingly based on fossil fuels energy and the beginning of the end of life on earth if we keep using them. It was the uneducated working class that innovated many devices to maintain growth in western society’s economies such as in 1765 James Wat produced a viable atmospheric steam engine that was five times more efficient than the previous ones; they were still safe and could be used in factories and ships. It took another 64 years of new technologies for a viable steam trains (1829). George Stephenson became an engineman for a colliery. He invented a safety lamp for the mines and created “The Rocket”, it had nearly all the feature of the latest steam locomotives, the main difference was the improved steel and size of the loco. Those inventions were the main reason American slavery could be curtail in 1861 it was mainly due to cheaper power from steam and improved mechanisation. It took a further 51years after Stevenson’s loco for Nikolaus Otto (1832 – 1891); he had served an apprenticeship, and produced a four-cycle gasoline-powered engine in1880. Thomas Edison, a Cooper. (1847- 1931) invented the gramophone and numerous things including his public image. Alexander Graham Bell left school at the age of 15, having completed only the first four forms. One of his many inventions was the telephone. Henry Sutton (1855 – 1912) born in Ballarat, Victoria Australia he was an inventor credited with contributions to many forefront technologies of the day, not as well known (he surpassed Edison with his inventiveness. The Wright brother’s repairers of machinery were the first to sustained flight in a powered, heavier-than-air craft, and 1903 Henry Ford a fitter and machinist; (1863–1947) was the first to mass-produced cars. There were also many inventions that facilitated agricultural production by farmers and mechanics. It was only after the early inventions the educated were inspired to conceive of the theories of thermodynamic. (Around 1850 Rudolf Clausius and William Thomson (Kelvin) stated both the First Law – and the Second Law of Thermodynamics. Relativity – Einstein 1879 –1955 Einstein could not find a teaching position so began work in a Bern patent office as a clerk in 1901 and as such formulated the theory of relativity in his spare time. He was one of many to increase our knowledge as a wage or salary worker. Oil the magical potion of globalisation, which gave the illusion of everlasting economic growth to supports an infinite size population on a planet of shrinking resources. For a little over a century we’ve use the best and easiest part of nature’s bounty to enable to take more of it to maintain economic growth regardless of its effect on life. We still kill thousands of people each year without trying on the roads due to the abuse of such precious substance, but it’s when we aim to kill that our military people excelled. However it’s the number of people oil as managed to support that may end life on earth. Its mindboggling how much we are dependent on oil directly and indirectly it’s now involved in one way or other in all aspect of our lives. Our self-awareness as a social being was and is subordinated to the needs of the few very competitive individuals whose main interest is self-aggrandizement in whatever field they’re in. That need by those people entails that humanity’s knowledge of its feeling as very social individuals are subjugated to the needs of the few who have little to no feelings for others. Civilised ideology implies that it’s the pinnacle of our faulty human social relationships, but the reverse is more accurate that’s, human social interactions are the pinnacle of relationships, which can only be fully expressed in small social groups where everyone’s character is known. On the other hand wherever habitats are favourable large groups tends to prevail enabling those individuals who lack feelings for others go easily unnoticed and if they’re clever can take control of those societies to fulfil their own wishes, it unfortunately entails competition with all the deceit and violence to have more of everything. Nevertheless, whoever takes control of any nation, whatever civilised system it has, can only do so due to the effort of the many that provides society needs from nature’s ability to give. Today, worldwide we use nearly 5 times more fossil fuels to renewables and nuclear energy. Thus global atmospheric concentration of carbon dioxide rose from 280 ppm pre-industrial time to 312 ppm in 1955 an increase of 32 ppm and then it reached over 410 ppm today, a total increase of 130ppm. That carbon retains heat, so our planet warms up. This releases more carbon from a multitude of sources to produce a likely runaway global warming state by maintaining those emissions a little longer. If that isn’t bad enough only a relatively small part of the carbon burned is used to maintain and improve people’s lives, however, a substantial part is used to manufacture military hardware used to subdue societies, which results in destroyed properties, the death or physical and mental injuries of millions of people including children. To win those conflicts countries need an industrial base that has many skilled workers and a knowhow led by scientist supported by a large population. That resulted in an increasing population on a planet of shrinking resources that’s dependent still more on non-renewables to keep it afloat; it’s a crime against our children. There were less than two billion people when I was born in 1928 and it’s now over 7.5 billion and its due to reach 9 billion within this century this’s an out of control and irresponsible chaotic state of affairs, a feature of nearly all civilised system as they’re formed to grow to out compete rivals. Food shortages are likely to occur in many parts of the world heightened by a sea level rise of meters submerging many cities and farms forcing people to move to higher ground creating unimaginable trauma. The increase atmospheric carbon already emitted has another 2 decades of increase heating; this is due to the oceans’ high inertia to temperature change. Nevertheless, world economies are trying to maintain their necessary economic growth by using more fossil fuels, but the more one uses a depleting resource the less affordable it will become hurting the increasing numbers of poor people. Nevertheless it looks like we will have enough fuel to make our earth too hot and thereby too violent a climate to maintain life. Also the carbon in the oceans increases its acidity, affecting crustacean and as they’re a primary food for fish, sea life will suffer, and as they are now overharvested, affecting countless number of people’s primary food source. On top of that, we will have increasing chaos caused by a hotter planet producing more uncontrollable forest fires of increasing ferocity, severe storms, and prolong droughts. This is within a world economy that must grow, but can’t on a per-capita base, as the cost of using more energy to produce and supply all the requirements of a growing population can’t match those demands. Mineral ores are a finite resource and some of them are now mine that previously were considered of too low grade to be economically mined, but due to technology that uses and are dependent on fossil fuels, those low quality ore can still be of value. The reduced quality of many minerals is starting to increase at a higher rate than our technological advances to maintain the required growth. Yet, that lack of affordable energy and stuff is being overtaken by global warming as our greatest threat to life. It’s not possible to function on those fuels and maintain our present lifestyle; nonetheless, the capitalist system must grow to survive, but to grow we have to use fossil fuels as renewables can’t fulfil all the energy needs of competitive economies. The unfulfillable demands of economic growth especially for nations trying to catch-up can lead to violent conflicts to attain the unreachable want of affluence. So we need and must have a very different system regardless of our indoctrination; but we know no other, that’s the dilemma, and unless the powerful people know what they are facing, life is done for. Civilisation is controlled by and for people with psychopathic tendencies, that’s people without or little empathy; nevertheless, they can function well socially but rarely if that, happens to coincides with their needs, conversely, now their future need is their survival, which can only be achieved by a cooperative effort. Our task is to ensure those few wealthy powerful ones see the present path that they and we are on has no future. We therefore, have a common future or none. Our planet can’t support 9 billion people in competitive relationships and might only survive with extreme difficulty in a cooperative system, to have a fruitful life we need to discard this worship of competitive activities and re-establish our natural highly social feelings towards one another and nature. Otherwise there’s nothing but outer desolation for today’s children facing the end of life on our planet. Renewable can only replace fossil fuels with great difficulties before that time if we abandon competitiveness and we all cooperate with one another and nature. Then there’s the question where will we get our minerals from, such as cooper. Tinkering with features of the economy that would both eliminate and supply all our present need plus the extra 2 billion expected people is wishful thinking. There’s no feasible plan as yet to remove that increasing carbon, so it’s still up in the air and it may still be increasing when our offspring are dying from multiple causes. Neoliberalism is the ultimate plaything for those talented people with little feeling for any one. They are psychopaths or act like one; they can take advantage of competitive situations to satisfy their craving for self-satisfaction. Because those individuals realise we have a strong need to cooperate and support one another, they use that obligation that nearly everyone has to satisfy their desires, which has at worse involve many millions of people losing their lives in an attempt to satisfy the dominant ones’ grandiosity. Until a few centuries ago we mainly use energy from one’s life time of sunlight on earth thereby we only did temporary damage to the biosphere; however, that has changed when we tapped into fossilised sunlight’s energy, that intense source of energy has also enabled us to use it to added to it, which has given us a faults sense of our and natures ability to keep providing ever more for ever more. 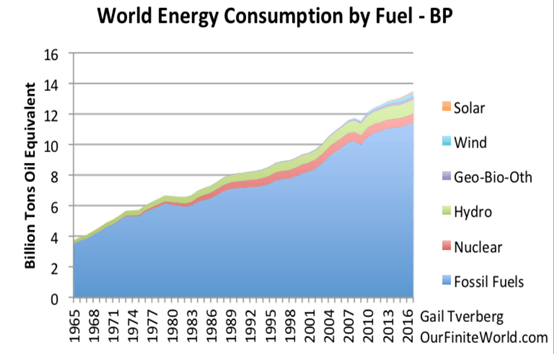 At the end of last century it looked like we could runout of oil but still have a liveable planet, however, due to our highly specialised and incredible ability of our chemical engineers, we solved that trauma, and so we now have enough fossil fuels to end life on earth. We act on two opposite needs, one which is our social nature of cooperating and helping one another, this is our norm; it’s what we expect so we take little notice of it. The other way that very few of us who are without emotional feelings is to satisfy one’s personal interest, which usually involves using people to fulfil whatever interest they may have regardless of any consequences to individuals, society and our planets life. Unfortunately we are on the whole satisfying the needs of the ones who have little feelings for us or anything. There’s little time left to save ourselves before global warming gasses become uncontrollable, this is due to the likely emission of methane hydrates in the artic water as they warms up. This’s the time for those few people who dominate us to see their demise if they continue on their course, however, competitiveness obscure their ability to see what’s ahead of them as those powerful ones attention is on their personal need for supremacy, thus we must ensure they see their demise if they keep on their present course. In spite of a lack of feelings for others, those dominant ones have shown to look after themselves very well, which’s a good sign as their survival, is link directly to everyone’s continued existence. We therefore have a common interest, so we need to be aware of that situation and help our oppressors to save themselves by saving our life. We civilised ones always needed to change our life style to have a better and easier way of living, but now it’s time, we do or die. We are on course to exterminate ourselves if we keep going; it will require a great deal of effort and sacrifice giving us increasing distress and despair if we maintain civilisation to the bitter end. Nevertheless, if we manage to undo the learning we all received and are now receiving from the media we can appreciate the ease it would be to survive by living life according to our highly social nature that nearly everyone has except for our sly few who dominate nearly all aspect of civilisation. We need a holistic appraisal of the planet’s condition, its life and its physical state and to use that information to plan a relatively coordinated survival policies to be implemented according to local condition. To do that we need generalist that’s non-specialist people, who can look at the interactions of a multitude of factors to put us on the best survival course. We already have so much information what’s lacking is the will to use it for life’s survival. Renewables must renew, not gradually diminish at accelerating rate as we are doing to them in many cases, also it would be nice to allow nature to re-wild itself. However, that’s a dramatic reversal in our attitude and activities, and that won’t be straightforward as it involved a complete reappraisal of life but would result in an easy, safe, and pleasant life. We need to see life as it is, not as we try to fit it in a civilised format of competitiveness, which has intensified speeding our progression to our obliteration. In contrast, all living things avoid competition if possible as it’s not only a waste effort but poses dangers of being overpowered suffering injuries or death. Even for sexual needs life prefer the least competitive situation if available. However, success can produce a crowded state that can give anonymity to those who are devoid of a need to participate in maintain society wellbeing, which depends on a cooperative attitude, instead to use that society and its people for their personal desires by whatever means available. It has created civilisation with all its physical wonders, military devastation, and social despair. But to survive we must be sure that those who have more power than others are scrutinised to see if they have feelings for other people’s suffering. Up until now it wasn’t possible to know every one’s character as we live within a multitude, therefore, normal people are susceptible to be taken in by the few clever ones who are devoid of feelings as they can hide their lack of it and use individual and societies for their needs. Fortunately, today we can us a MRI scan individual to see if they have very little to no feeling for their fellows. Therefore a compulsory MIR scan for those who could have power over others, like we test driver for road skills, knowledge, vision and influence of alcohol to allow them to drive or to pilot an airplane. As far as the undecided masses are concerns, they will do whatever to maintain or create social harmony of whatever hue; therefore a simpler compassion life will be in harmony with their needs. There should be little difficulty with the Christian people or Churches in propagating attitude of minimal demand from nature and sharing on a world scale, it’s a matter of maintaining consistency with one’s belief and the need to be socially compatible. Likewise the Buddhist also has a peaceful philosophy, but like Christians at time can be deceive and enticed to do the opposite. Many Christian have already been highly involved in that task. 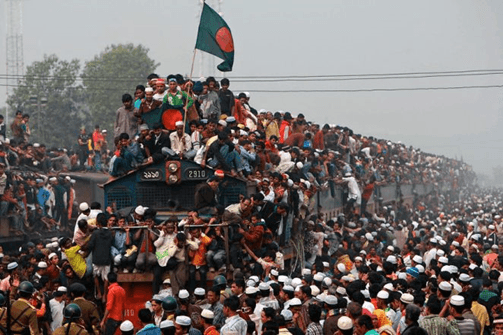 By looking at this Bangladesh railway we see there could be too many people to fit in but there’s no squable. This shows that humans are very peaceful and cooperative able to cope with difficult situation. I wacht that video for about 10 minutes, no sign of a squable. Secular organisations that are non-committed would find it difficult not to be involved in reducing our footprint. While business people’s thinking is on growth, but during WW2 they agreed to reduce their business activities if it wasn’t essential for the war effort, they were difficult times, but nothing as vital as we face now. High population numbers multiplies our survival difficulties so the quicker we reduce our numbers to the pre-oil era the better our ability to survive and be healthy. Furthermore our social systems that bequeath wealth-power to one’s children can negates their happiness and is anti-social, it denies the health and contentment of all, it sacrifices inheritors by having to look after that burden and deprives a multitude of a good life. We want the best possible life for all children, and that needs a reduce population instead of an unlimited one to give our offspring the finest and safest life within a multitude of living things. However, the present economy is motivated by greed therefore we have an increasing population with a growing disparity to the bitter end. Or we can share our natural resources with all living thing to have the most secure future with the best possible life for all. To survive we need a life style that conforms with our social nature, which is compulsively cooperative, it’s so because we have the mental and physical ability with a psychological need to look after each other. It’s the life style that fits in with the general ecosystem it’s an easy one to live in, furthermore it will reduce the incidence of mental disorder that are presently increasing due to the alien life of neoliberalism the latest civilised version that’s inflicted on us. Furthermore, by living in relatively small supporting communities focussed on helping one another it will produce the greatest contentment for all. We then can pursue our need to have the best environment instead of abusing the best one. Children would have the best secure social environment with multiple parents reducing the stress on them, while it would increase the security and opportunity for the child and as all children would have an older and younger sibling so everyone would have close to equal opportunity to have. This would mean all children would have as close to the best possible start in life instead relying on the luck of parents and children have by living in semi isolation. That communal life is very secure for both parents and children; it was our original way of living until private property’s importance dominates social life as one purpose of children is to keep the loot in the family. Furthermore, communal living is the most satisfactory way to reduce our population without missing out on the joy of nurturing the young and the responsibility of looking after the sick and the aged but most beneficial is surviving in a world of continued wellbeing instead of increasing hardship leading to life’s demise. It would give the most secure life for the young and old where every one’s character is known, understood, accepted and interacted with according to their personality. Nevertheless, it’s likely we will need cities due to complex logistic issues, involving many people fortunately if we do really need such position of power, today we can know those few people that have so little feeling for others to be debarred from positions of power over others. Those few people who lack any feelings for their fellows seem to assume that there’s something weak about us when we express distress at seen or experiencing gross unfairness. According to them one needs to toughen up. We are what we are because we came through a billion year of evolution which fine-tuned us to have an extremely able body, but even more important we have, apart from a tiny number of individuals, an exceptional social needs with a sense of fairness and the skill to practise it, all enhanced by our ultimate intelligence, which maximised our capacity to live anywhere on earth and beyond. But such great ability poses problems from the ability to manage and sustain a large population without it been controlled by the few that have little to no emotional feelings. On the other hand in hunter-gatherer societies due to their few members it was easy to know the ones who lacked feeling for their fellows and therefore could be kept under control as they can play a constructive role. However, in communities of thousands of people it’s not possible to know the character of many individuals, this makes it easy for those conniving people to deceive us and by the time we realise the charm received was devious it’s a Fait accompli. However, there’ll be no survivors no matter how wealthy or powerful they may be, so we have a common interest of survival it’s the strongest possible one so we need to use it. It’s not taking wealth from anyone the emphases is on surviving and helping everyone to do so in a cooperative way, which can only be peaceful. The old order of competition is no longer survivable, we can only have cooperative activities to look after every one and life in general. There’s no problem once we know what we must do to maintain life. Once most or even some of the powerful ones realise there’s no other way to survive but to abandon competition we have a good chance of survival and have a useful enjoyable life. Furthermore, all competitive activities are antisocial in character this goes for all sport whether it’s boxing or chess as they all use deceit as a tactic which are doubly dishonest as participants pretend it’s honest because it’s OK by the rules. There’re many activities physical-mental that doesn’t entail having to defeat an opponent, where all participants benefit emotionally, physically and intellectually and I envisage many more will be introduce.